Using the same approach to cattle well-being as to beef quality assurance will allow producers to meet animal welfare goals without regulation. MANHATTAN, Kan. (May 19, 2010) — Bob Smith emphasized the importance of adopting industry guidelines — such as Beef Quality Assurance (BQA) practices — through the entire beef production chain as he addressed participants of the International Symposium on Beef Cattle Welfare May 19. Smith, who is a veterinarian based in Stillwater, Okla., works in private practice with five other veterinarians at Veterinary Research and Consulting Services. The group works with feedlot and stocker cattle clients across the High Plains. Producers can solve problems without regulation, Bob Smith says, but to do so they need the problems identified and proper education and training as to how to eliminate those problems. 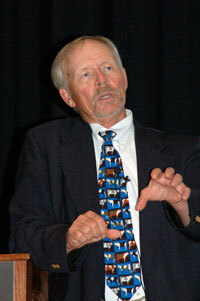 Smith has also been active in cattle and veterinary organizations, including the BQA Advisory Board; chairing the National Cattlemen's Beef Association (NCBA) Cattle Health and Well-being Committee; and serving as president of the American Association of Bovine Practitioners, the Academy of Veterinary Consultants and, currently, the Western Veterinary Conference. He shared how in the past through BQA and the Beef Quality Audits, injection-site lesions were identified as an industry problem. Then, through education, the incidence of these lesions was reduced from over 20% to 2%. “This tells us producers can solve problems without regulation as long as the problems are identified and education and training is provided,” he said. In advancing animal welfare efforts throughout the beef industry today, Smith credited the industry with building on BQA principles and more recently developing the Cattle Care and Handling Guidelines to set standards for animal care from nutrition, feeding and health to cattle handling and euthanasia, and the BQA Feedyard Self Assessment Guidelines to conduct self- or third-party audits evaluating safety, quality, environmental and animal welfare practices. Particularly of the self-assessment guidelines that can be used for audits, Smith said he is hopeful these become the accepted audit format by all interested parties, and he shared that similar guidelines for self- or third-party audits are being developed by the industry for cow-calf and stocker operations — again so that a proactive role is taken. Smith credited the newly instituted Masters of Beef Advocacy program as another proactive means to educate people working in the beef industry and in turn helping them better inform consumers about their stewardship and animal care efforts.